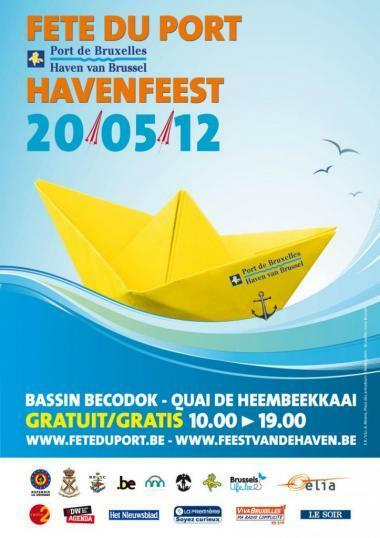 2012-05-02 – On Sunday 20 May, the Port of Brussels(*) will hold its biennial festival for the twelfth time. This year, the Port Festival will be showcasing some impressive ships and will also feature plenty of music, from Béco Dock to Heembeek Quay, from 10 am to 7 pm. This should be a fun occasion for fair-weather sailors and genuine boat fans alike. Entry and all activities are completely free of charge. Brussels will host an exceptional fleet with a 59-metre three-master, a 49-metre three-master, a schooner, a depot ship for mine clearance divers, an Ostend shrimp boat, etc. The Port Festival will also take part in the festivities in connection with Brusselicious, the gourmet year in Brussels in 2012. Among other things, a giant North Sea paella will be made on Heembeek Quay. On the musical front, various concerts will be held on the quays, including jazz, folk, sea shanties, Piknik Elektronik Akwatik and more. The programme will also feature some spectacular entertainments from the Ministry of Defence, collections of nautical models, street shows, demonstrations on the water, scuba diving and rescue dogs, among other attractions. (*) The Port of Brussels, a company governed by public law, manages 14 kilometres of waterway and 6.5 kilometres of quayside in the Brussels Region. The Brussels port estate has an effective area of 85 hectares. It is home to nearly three hundred and fifty companies and has an annual throughput of 24 million tonnes for all modes of transport combined. In 2011, 7.2 million tonnes were transported by waterway – the equivalent of more than 720,000 truckloads.